road bike ride of the season. It was 65 degrees outside, with plenty of snow in the woods and sand on the roads, but I simply could not resist getting the bike out. Some of my readers may not realize that the Adirondacks have great, no, awesome terrain for road biking. Lake Placid has hosted Ironman since 1999 and the Iron competitors frequently tell us Lake Placid's bike course is the best Ironman bike course in the world. We also host a plethora of other bike races throughout the year here in the Adirondacks. 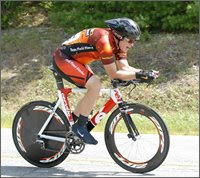 The upcoming Wilmington-Whiteface road race scheduled for Saturday, June 21, 2008 is going to be a great event. If you like road biking, I suggest you check out the Team Placid Planet website to learn more about this race and biking in the Adirondacks. I will be posting more information (much more) about cycling as we get into the season, but suffice it to say I arrived back home filthy from road dirt, but very happy to be back in the saddle again!